Thank god it's Friday night and I just juuust juuuuust, go paid!!!! Except I didn't, ha ha. Anywayyy, what a week! We had Monday off for President's Day and I spent the day with my Aunt, Uncle and cousin. Then Tuesday - Thursday it was time for work. As you can see, Operation Wear All My Blazers to Work is going quite well! Five down, twelve to go! So that means it will take me about a month longer, assuming I wear a blazer every day. In other exciting news, The Outnet is launching Oscar de la Renta for THE OUTNET – an exclusive, limited edition collection of 23 distinctive, ready-to-wear styles referencing classic silhouettes & iconic fabrics from Oscar de la Renta. The collection includes full skirts, wide leg pants, skirt suits and fifties-inspired dresses. Silk faille, boucle and irate feature in neutral hues, vibrant brights, floral prints and monochromatic graphic elements. Designed by Oscar de la Renta, the collection revisits memorable runway pieces and creates new fabric and shape combinations to offer a fresh interpretation of Oscar de la Renta's quintessential style. The collection launches on Tuesday February 26th with prices ranging $325 to $1,295. A fun promo video, starring Olivia Palermo, has been released by the website. I love your Thursday outfit -- and congrats on all the blazer wearing, they all look awesome. LOVE! I'm inspired! 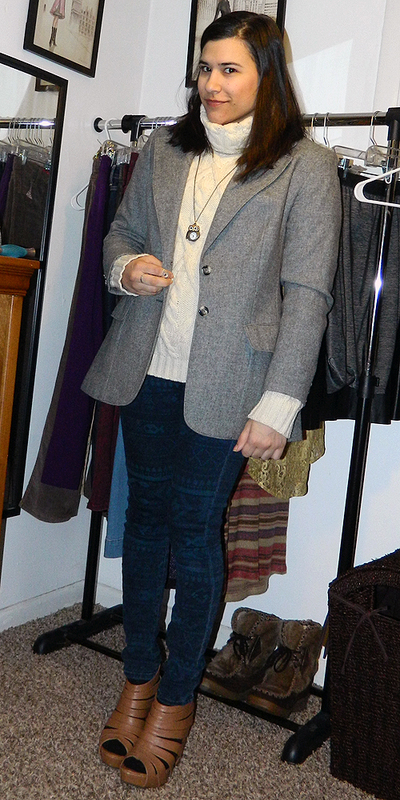 I'm definitely going to write a blazer/jacket post very soon. ... Presenting an award at Mugglenet's Harry Potter Oscar Awards! What?! Wow! Soooo impressed! I need to enact a similar "wear all my blazers" operation. I have quite a few that haven't seen the light of day in a while! Great job wearing your blazers, I remember last week you set that as your goal and you did it so in style! Hooray for pay day, is even better when it comes on the weekend! with two more blazers added to the collection this week I guess you really should stop buying them, or you will never get through the challenge. haha. I love those rich, berry tones! Suite! WOW that burgundy or as it's now called oxblood - outfit is beautiful on you ! nice looks, I like the second one! LOVE those turquoise heels! I want to see more of them! I am in love with those genetic denim jeans, I have wanted them for so long! Love Oscar! Too bad the pieces are so highly priced. I would love to see him be the next designer featured at Target! 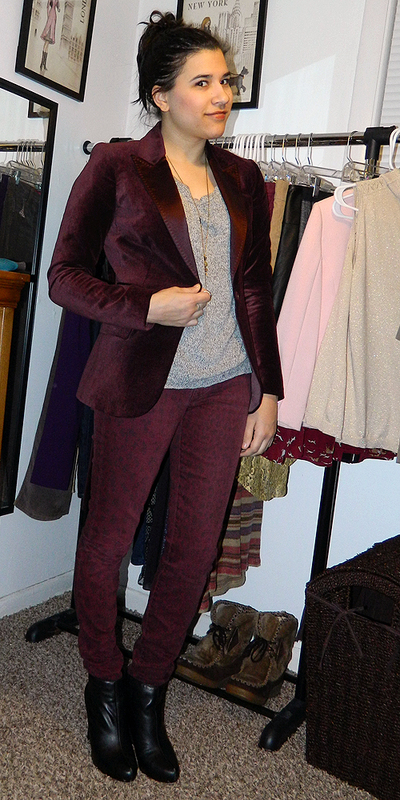 I love all of the different blazers, especially the burgundy one. Enjoy your weekend. Oh my, I love the outfits! Aaaaand Harry Potter Oscars?? Yes, please!! I still cannot get over your blazer collection. I have been meaning to watch the Olivia P's ODL video. She is a beautiful creature.. So alien like but chic and pretty. That purple blazer is awesome. 17 blazers?! Does that include the ones you bought last weekend?? Oh man. But it's so hard to turn down a great blazer at a great price!! ARGH! Wow that's an amazing blazer collection you have there! 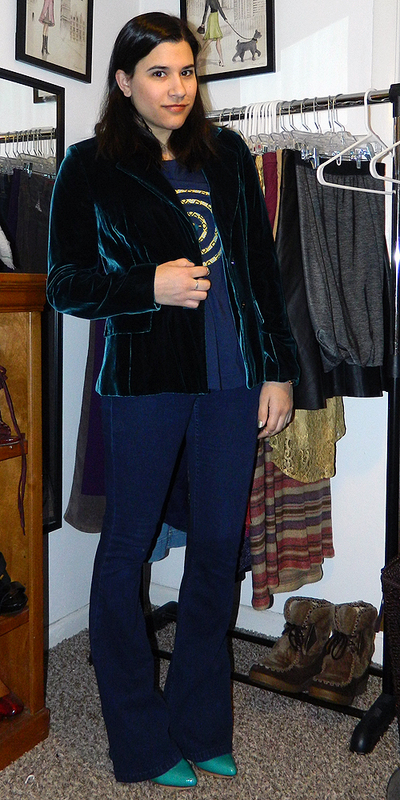 I really like the velvet one. It looks really good! thank ou for sweet comment:) follow each other?